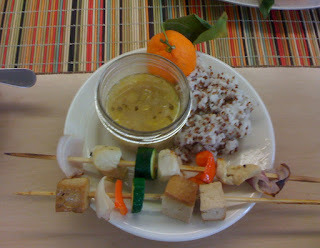 A tasty plating of brochettes with quinoa & rice alongside a cup of leek & potato soup. It was the second to last week of the semester and I wanted to cover a lot of territory. What can we cook that would be a good basis for future cooking at home, not too complicated and not too expensive? Brochettes (“skewers”) and soup had the most variety. For the brochettes, a few different marinades, a lemon-like vinaigrette for the chicken and a teriyaki style for the tofu — and we remembered to soak the skewers in water ahead of time. It also gave us a chance to go over raw meat handling and cross contamination again (those squeezed lemon halves come in handy for helping to kill germs on that cutting board too). We added some red quinoa (prounounced “keen wah”) to the rice, adding protein and a little more tooth to rice, which has a tendency to mush out for us in large quantities. Red quinoa doesn’t break down quite as easily as the blonde variety, so it was a definite help. The soup? The grandmother of soups, leek and potato. Easy and it can become so many things. Add more vegetables or grains ,herbs & pasta for a vegetable soup or stew. Puree as is for a smooth soup, or puree, add cream, garnish with chopped chives and you have vichyssoise (got some shocked expressions envisioning a cold potato soup tasting good). They really liked this simplest of versions, hot and unpureed, and liked that this was so easy to make. We also kept it simple this week because I wanted to move through a lot of interview practice, in preparation for our mock interviews with our volunteers. This idea didn’t meet with a fanfare of excitement. It took some time for my students to go from not wanting to participate at all to realizing that someday very soon, there will be a need to be interviewed, whether for a job or for getting into college. Some were afraid that they would sound like they were boasting, but after a bit of practice they realized that what they were really doing was talking effectively about themselves, more like standing up straight with a smile than puffing like a rooster. A helpful tool: a list of job-friendly attributes a student can review and circle those that best apply to him or her. We pulled these out when we got stuck in our practice sessions and they all found ways to pick attributes and apply them to something that they have done. The students hear me talk a lot about responding positively to a situation, it seems that the default in our society is to point out what someone is doing wrong, not what they are doing right, and often not focusing on figuring out and fixing the actual problem. But in a job situation your ability to frame what you say in a factual or positive way is much more valued than putting others down. It makes you stand out well when you swim against the stream in this way. And again, not like a puffing rooster, but with effective positive awareness. Interviewing helped us take that positive response we’ve been working on in class and turn it into positively talking about oneself. At the end of our mock interview sessions with our adult volunteers everyone stood a little straighter with a smile.